A good theme can transform any event, regardless of whether it’s a glamorous gala or a simple corporate function. But don’t fall into the trap of selecting the same old tried and true themes each time. Instead, shake things up with one of these three creative styles that will leave a lasting impression on your guests. An outer space event theme provides the perfect opportunity to get creative with your audio visual installations. Set the scene with a projector screen displaying imagery of the solar system, or play clips from your favourite space-themed movies. Enhance your venue’s space-age appeal with event lighting in bold and beautiful colours. Set the regular lights on low, or switch them off completely, then use neon beams in green, blue and magenta to add a sci-fi appeal. Twinkling fairy lights can mimic the night’s sky while also adding intimacy. Hang Chinese paper lanterns around the room to mimic the planets, and set up a sound system to play ambient tunes all night long. Encourage guests to bust out their bellbottoms and polish off their platform shoes for a funk party to remember. Your playlist is essential here, so spend some time working on it to ensure it captures this decade perfectly. Alternatively, consider hiring a DJ or even a band to set the mood – just make sure you have a professional audio system on hand to project the sound far and wide. A disco ball is a must-have and should be placed in the middle of your dance floor for best effect. A light-up floor can also add to the funk appeal, with spotlights roaming around the area to entice guests to get on their feet and start dancing. 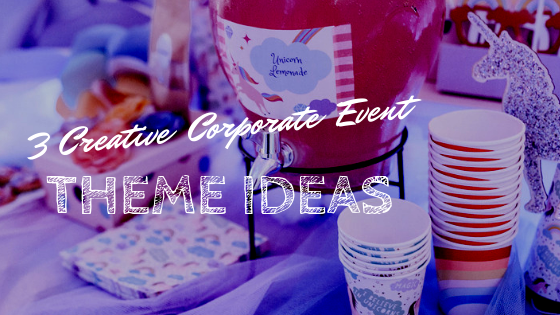 Everyone loves candy, and theming your event around this sweet treat means you can really let your creative juices flow. Pastel colours work well when draped in fabric around the room, with soft uplighting complementing your warm colour palette. As for the menu, it goes without saying that there should be sweets in abundance. Just make sure you provide some more substantial food too! Pro Light & Sound are the AV Styling geniuses and can help you completely transform your event into a fantasy land that will surely leave your guests talking about your function for years to come.